If you're going to Rome you must, absolutely must, visit this hidden gem - you'd be crazy not to. we found the fountains at the end of a long day - the way we had planned to. We spent the day walking and exploring Rome and the fountains were our last stop for the day. That was day two of or stay in Rome and from that day on, we somehow ended up by the steps of the fountains every night after. I'm not sure why but I expected the fountains to be in a park, or a garden or some huge courtyard (somewhere spacious), much like fountains in the UK but this was quite the opposite. The Trevi Fountains are situated in a small side street, surrounded by hotels, shops, a basilica and people, lots of people. We took a turn from the main street into a side street and bam - there they were, hidden within the business of Rome. It's so obvious that the area grew around the fountains and that's what added to the splendour of them. Definitely go and see them!! This, as the name implies, is a set of steps leading up to a Church. If you go down the steps, you'll come to a small yet beautiful fountain and lots of shops, a few street sellers and a few horse drawn carriages. The steps were really lovely to look at and walk down and the view from the top was quite something. As is the view from the bottom when you see the full extent of the Spanish Steps. 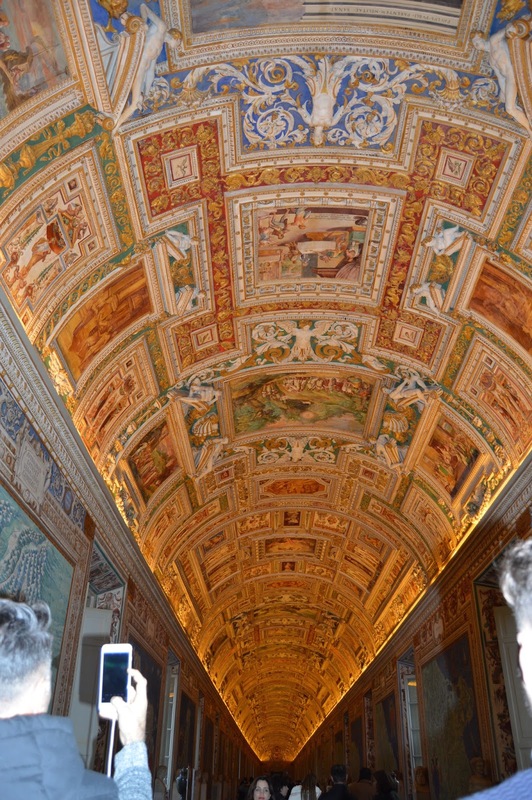 Right, so on the last Sunday of every month Vatican City opens for a few hours and entry is free - that's right, free. We were, conveniently there, in Rome, on the last Sunday of the month and we had planned to go then, but we asked around and were told that if we wanted to go, we'd have to be there for 8am in order to get in around 12pm when they opened....that was so not happening. Also, the Pope was going to visit so as a bonus, we could have seen the Pope. But apparently it gets so so so busy that we decided to pay the entry fee and take a look another day. 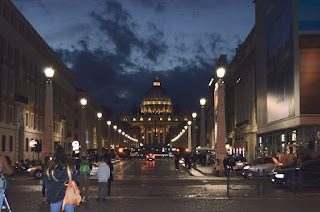 We took a bus to Vatican City - one of the few times we actually took public transport. We walked everywhere else! As soon as we got there we were mildly accosted by tour guides, claiming that but going with them we could skip the hour long line to get in and see things much faster. But we decided to stand in line - experience it all! It was about an hours wait, maybe less but the line of people behind us didn't reduce at any time - there were times where it got longer but never shorter than where we started! Was it worth the wait - yes. St Peters Square is beautiful, the amount of time and work that must have gone into making it - one thing I'd tell you to do is to look up when you are there. Look up at the buildings and how they're made, the detail and their finishing, the angels on the ends, standing and watching. Inside, it's beautiful - as one would expect. The walls are decorated from top to bottom and there is so much to see - so much to soak up. This goes for everything there - the paintings, the sculptures, all the artwork is phenomenal and worth seeing, from the works of Michelangelo to Raphael. 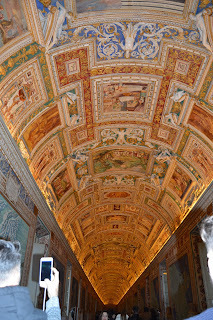 The Sistine Chapel was in the Vatican City Museum at the end and there I found the atmosphere to be serene, peaceful and we spent a lot of time looking at the walls and ceiling. They also must pay someone to 'shhhhh' very loudly because that persons ever so slightly annoying. If you're in Rome - go. One of last things we did was to visit the Coliseum. We could see glimpses of the Coliseum from our hotel and the side streets - it's a view I'll never forget. The Coliseum lit up at night is beautiful - and I think it's beautiful in the day time too. My personal opinion - I didn't find it as jaw dropping as I had expected - I had gone in with images from the Gladiator film expecting it to be huge on the inside and it wasn't as big as I had thought - in reality it's much smaller. It was worth a look because not seeing it would have been silly, but I wasn't that impressed. I think maybe next time I'd take a tour which takes us underneath the Coliseum - where the Gladiators and animals actually lived. We had walked past the Forum every day since our arrival and so we knew what to expect before we visited it properly - ruins, a lot of ruins and Palatine Hill which overlooked the Coliseum and the Forum. These are but a few places we visited in Rome - I haven't even mentioned the Pantheon, the numerous Basilicas and monuments we came across. There was just so much to see. And the food. Oh the food - delicious! Have you been to Rome? Is it somewhere you'd like to go? The Trevi fountain is gorgeous, and I've heard they gather the money thrown in the water and donate it to the homeless. And Michelangelo's paintings inside the basilica are stunning!! You are so lucky! !